Most publications on global warming related issues have run stories on belching and farting, methane-emitting cows and sheep in the last 24 months. It’s not just a quirky issue but it’s seriously important. Belching and farting cows and to a lesser extent sheep pose a significant global warming threat to us humans. 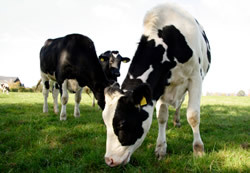 Cows alone account for 4 percent of all greenhouse gases in the atmosphere. That’s an extortionate amount. It’s all to do with the diet cows are on. They daily consume around 150 pounds of grass, hay, and silage as well as 20 pounds of manufactured fodder with high concentrations of fibers and other nutrients. A cow’s stomach is a permanent disco party featuring billions of bacteria and fungi. When the feeding frenzy’s over a bacteria called the archaea will have latched on to the hydrogen and carbon dioxide that the digestive process has produced, causing a chemical reaction of astounding proportions. Each cow emits up to 100 gallons of methane a day because of this. Every day. The bovine flatulence issue, nothing to cows but insidiously harmful to the atmosphere, is among the thorniest of human related climate change topics because we’re such feisty beef eaters and because it’s so difficult to ‘cure’ cows. Beef consumption has been and will be rapidly rising around the globe. And the consequences of this are considerable. Over the past 50 years, methane levels in the atmosphere have increased six times and much of that is directly linked to human beef consumption. Belching and farting are such integral parts of the cow metabolism that there’s not a lot that can be easily done about it. So scientists around the globe are now attempting to get to the absolute bottom of the implications of changing the cattle´s diet. That’s as precarious as it sounds. In some of the research, the Australian kangaroo has featured prominently because this animal is on the same diet as cows and sheep and produces almost no methane. The Queensland government in Australia reportedly is three years away from the production of a medicine modeled on live bacteria from kangaroo stomachs. The bacteria curb virtually all methane production. The researchers want to feed it to both sheep and cows and say a positive side effect of the medicine will be that it improves the digestive systems of cows and sheep to such an extent that they’ll need 15 percent less fodder. That news has Australian farmers jumping up and down because it can potentially save them millions of dollars in feed costs. Since they’re facing droughts almost every summer, that’s a very welcome development to them. Whether the kangaroo bacterial medicine will become controversial remains to be seen, but my hunch is that it just might get animal rights activists a bit worried. However, the Australian scientists need at least another three years to even isolate the bacteria and then it will be another nightmare to pinpoint a method to transfer it to animals such as cattle and sheep. German scientists have devised a tangible medicine combating bovine flatulence which has surprisingly similar side effects as the Queensland government scientists. They created a 100 percent plant based pill which can be given to cows on a strict diet and it needs to be administered at a carefully chosen time. The tablet is the size of a tennis ball and the researchers responsible for composing it are saying that it helps the cow to turn some of the methane gases into extra milk. Once a cow has been fed a German pill, microbiotic substances will slowly be dissolved in its stomach in a process that takes a few months. Winfried Drochner of the University of Hohenheim in Stuttgart says that the substances will trap the gas and get the cow to produce glucose from it rather than belching it out as methane-rich wind. Theory is that more glucose produces more milk and that cows’ wellbeing will improve. British researchers are also looking into possibilities to change cows’ diets in a $1.5 million government project. They are pioneering reduction of methane production by feeding the cows grasses with higher levels of sugar. The researchers, based at the UK’s Science Development at the Institute of Grassland and Environmental Research in Aberystwyth say sugar is known to help digestion. “More of the ingested carbon and nitrogen will be converted to meat, milk, hide, and wool,” they said. They are focusing on finding out how sugar rich plants can grow more abundantly in British grassland and also how to increase the sugar content in them. So long as science doesn’t yield any immediate conclusive answers or solutions, just steering clear of beef altogether might be the best idea. This is where Australians have an easy choice because they can just switch to kangaroo meat. Check out the potential of such a decision; according to research commissioned by Greenpeace Australia, only a 20 percent reduction of beef production in Australia equals 15 million tonnes of methane. “Beef production is chosen in this measure because it is responsible for the biggest share of livestock-related methane emissions,” said Mark Diesendorf, a New South Wales scientist who’s the author of the Greenpeace report entitled Paths to a Low Carbon Future. Diesendorf is aware that his call for reducing beef consumption runs into political resistance, but nevertheless his advice is seen by many as part and parcel of Australia’s possible options for lowering greenhouse gas emissions by 30 per cent by 2020. That’s food for thought for people elsewhere. Thanks for your comment and clarification. GWIR certainly isn’t promoting the idea of eating kangaroo meat! Methane gas from cows is indeed a big problem for global warming. It would be nice to have all the cows connected as the man in matrix, the movie.